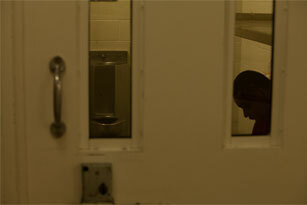 A detainee sits in his windowless cell in solitary confinement for 22 to 23 hours a day. 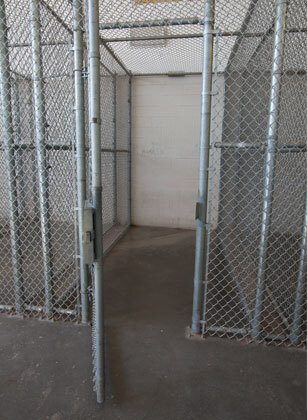 The indoor enclosures, which detainees call "the cage," where those in solitary can pace during the one-hour "recreation" periods in Pinal County, Arizona. Workshop filmmaker-in-residence Catherine Rentz, who co-produced "Lost in Detention" for PBS Frontline and the Investigative Reporting Workshop, and New York Times reporter Ian Urbina wrote this story for The New York Times. The Workshop will produce video and radio reports about immigrants in solitary confinement in the weeks to come. WASHINGTON — On any given day, about 300 immigrants are held in solitary confinement at the 50 largest detention facilities that make up the sprawling patchwork of holding centers nationwide overseen by Immigration and Customs Enforcement officials, according to new federal data. Nearly half are isolated for 15 days or more, the point at which psychiatric experts say they are at risk for severe mental harm, with about 35 detainees kept for more than 75 days. While the records do not indicate why immigrants were put in solitary, an adviser who helped the immigration agency review the numbers estimated that two-thirds of the cases involved disciplinary infractions like breaking rules, talking back to guards or getting into fights. Immigrants were also regularly isolated because they were viewed as a threat to other detainees or personnel or for protective purposes when the immigrant was gay or mentally ill. The United States has come under sharp criticism at home and abroad for relying on solitary confinement in its prisons more than any other democratic nation in the world. While Immigration and Customs Enforcement places only about 1 percent of its jailed immigrants in solitary, this practice is nonetheless startling because those detainees are being held on civil, not criminal, charges. As such, they are not supposed to be punished; they are simply confined to ensure that they appear for administrative hearings. After federal immigration authorities caught up with him, Rashed BinRashed, an illegal arrival from Yemen, was sent to a detention center in Juneau, Wis. He was put in solitary confinement, he says, after declining to go to the jail’s eating area and refusing meals because he wanted to fast during Ramadan. As lawmakers in Washington consider an overhaul of the immigration system, Congress faces thorny questions not just about what status to grant immigrants already in the country, but also about how best to increase enforcement efforts and what rights to ensure illegal immigrants during their detention. The new federal data highlights how punitive and costly immigration policy has become, since solitary is one of the most expensive forms of detention. Rashed BinRashed won his case in court against being deported but says his solitary experience was the worst of his life. “ICE takes the mental health care of individuals in the agency’s custody very seriously,” she added. The agency declined to talk about particular cases, citing privacy concerns. Another agency official, who was not authorized to speak publicly, emphasized that some detainees who are put in “segregation units” have criminal records, gang affiliations or histories of violence. While the conditions of confinement vary, detainees in solitary are routinely kept alone for 22 to 23 hours per day, sometimes in windowless 6-foot-by-13-foot cells, according to interviews with current and former detainees and a review of case records involving more than three dozen immigrants since 2010. Access to phones and lawyers is far more restricted in solitary; occasionally such communications were permitted only in the middle of the night when it was unlikely anyone would be available. Immigrants are typically given an hour or so of recreation each day, detainees said. In some facilities, that is limited to pacing in what detainees call “the cage,” a sparse indoor enclosure with concrete floors and fencing on all sides, similar to an indoor dog kennel. The federal data, which officials began reviewing a year ago at the request of immigration lawyers, offers the first public snapshot of the number of immigrants held in solitary confinement, how long they were there and how many had mental health problems — about 10 percent. The 50 facilities that were reviewed by the agency over a five-month period hold about 85 percent of the agency’s average daily population of 34,000 detainees. The tallies provided by the immigration agency are probably low because many of the detention centers failed to report segregation statistics during some weeks of the review, and some did not include mental health cases in their tallies. The immigration official who requested anonymity said the agency closely monitors conditions to ensure that isolation practices adhere to agency guidelines, including regular reviews of the solitary cases and visits by medical professionals. In exit interviews and case documents, immigrant detainees describe varying reasons for being sent to solitary. At Pinal County, Ariz., for example, a detainee reported being sent to solitary for nearly three months after allegedly arguing with a guard. He said guards denied his request for a video review of the situation before sentencing him to solitary. Another detainee in Sherburne County, Minn., said she was isolated after guards found some peanut butter and a Kool-Aid packet in a bag in her cell, a violation of the rules. Agency officials say that they are limited in their ability to use ankle bracelets and other alternatives to detaining immigrants in its 250 jails, private prisons and other facilities. The agency pays an average of $122 per day for each immigrant it detains. The agency does not track the cost of solitary confinement, but experts say the practice can triple the cost and can be hundreds of times more expensive than alternatives like using electronic ankle bracelets. As the Obama administration has stepped up enforcement, the immigration detention population has increased; it is up by nearly 85 percent since 2005. When illegal immigrants are detained, they are typically not given sentences with end dates; they are held, sometimes for months, until they voluntarily sign deportation papers or immigration authorities determine whether they can stay or will be deported. Delfino Quiroz sunk into depression after being held in solitary for four months. Quiroz, who is gay, said officers told him it was for his protection because of his feminine appearance. Although the immigration agency’s new guidelines limit the use of solitary to 30 days for each disciplinary infraction, there are exceptions, and such confinement can be indefinite, according to data obtained by the National Immigrant Justice Center and the Investigative Reporting Workshop. Solitary confinement is widely viewed as the most dangerous way to detain people, and roughly half of prison suicides occur when people are segregated in this way. Deprived of meaningful human contact, otherwise healthy prisoners often become deeply troubled. Paranoia, depression, memory loss and self-mutilation are not uncommon. No data is available on how many of the 18 suicides out of 133 deaths of detained immigrants since 2003 occurred in solitary units. Dr. Allen Keller, the director of the New York University Center for Health and Human Rights, said that when he interviewed about 70 immigrant detainees a decade or so ago, roughly a quarter said they had been put in solitary at some point and about 40 percent said they had been threatened with it. Trauma experts say the psychological impact of solitary may be more acute for immigrant detainees because many are victims of human trafficking, domestic violence or sexual assault or have survived persecution and torture in their home countries. For example, Ronal Rojas-Castro, a Honduran immigrant, was detained for eight months after entering the United States illegally last April. He was caught after being held captive by smugglers for five days with more than 100 other people in a house in Texas near the Mexico border. When one of the immigrants managed to call for help, the immigration agency was alerted, and Rojas-Castro broke his ankle trying to run away. Juan Mendez, the U.N.'s special rapporteur on torture, calls for a complete ban on the use of solitary for those who are juveniles or those with mental disabilities. He was later caught and put in solitary, he says, because guards said his crutches could be used as a weapon. Rojas-Castro was kept in complete darkness for four days, wearing only his underwear. Dr. Kupers, the psychiatrist at the Wright Institute, said: “Immigrants have the worst situation. They have no advocates. Their family is afraid to complain.” Detainees are not automatically represented by legal counsel, and about 85 percent have none. BinRashed, the Yemeni detainee, had been in the United States for five years after fleeing his civil-war-ravaged country in 1999. He arrived as an asylum seeker, but was detained in 2005 for having falsely listed his country of origin as Somalia. He was held for nearly three years in immigration detention, but he won his case in court against being deported and now lives in Chicago with his fiancée and her son. He recounted his time in solitary confinement as the most awful experience of his life. Todd Nehls, the recently retired sheriff of Dodge County, Wis., who ran the detention facility where BinRashed was held, said in an interview that he did not believe his officers would have placed the detainee on 23-hour lockdown for refusing meals, but that BinRashed could have been isolated for breaking rules or being argumentative. Nehls added that he did not recall specifics about the case. Quiroz says officers told him he had been placed in solitary for his own protection because he is gay. When he was caught driving drunk in 2010, Quiroz had been living in the United States waiting for legal status from an application that his father, an American citizen, submitted 12 years earlier. 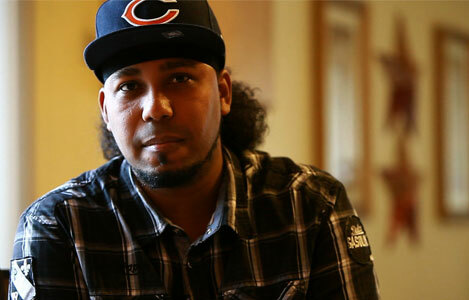 While his legal status was being determined, Quiroz was not required to leave the country, but his probation officer handed him over to the immigration agency, which sent him into detention in Houston. 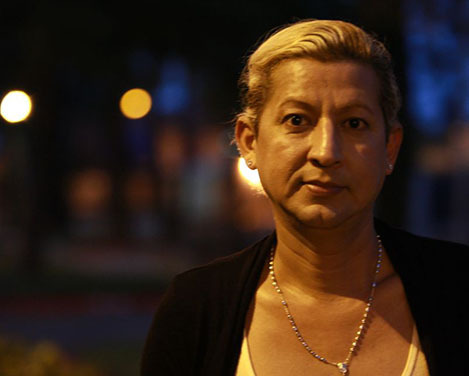 Against his objections, Quiroz, like many other gay, lesbian and transgender detainees, was placed in solitary. He was released from detention in March 2011. In recent years, pressure has increased to limit the use of solitary in other settings. After a Senate hearing last June, the federal Bureau of Prisons said it planned to review its policies and immediately reduce by about 25 percent the number of prisoners in isolation. 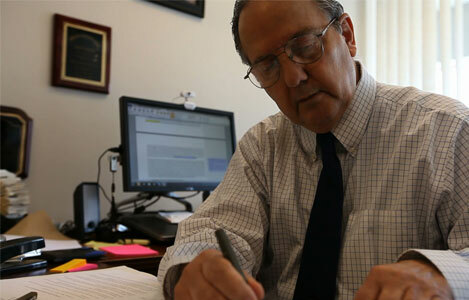 Last year the United Nations special rapporteur on torture, Juan Mendez, called for a ban on solitary confinement except in limited situations and singled out the United States for its reliance on the method. He recommended a ban on prolonged solitary confinement, meaning longer than 15 days, because, he said, the sensory deprivation may amount to torture. He also called for a ban against isolation for juveniles and those with mental disabilities. Also on the Workshop's site: a detailed map that shows where the detainees are being held in solitary and a story on how solitary confinement is viewed by the U.N.
Should immigrant detainees be supplied lawyers?